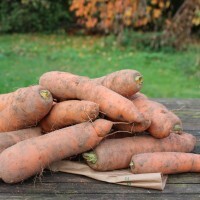 Our main crop carrots: larger ones selected for juicing, just as delicious as the smaller carrots. Expect a few blemishes that will not effect eating quality or storage. When they arrive, store them in a bag, in a cool place. Do not wash until you are ready to eat them; the soil helps retain flavour and nutrients and improves storage.